CERC models are continually validated against available measured data obtained from real world situations, field campaigns and wind tunnel experiments. Validation of the ADMS dispersion models has been performed using many experimental datasets that test different aspects of the models, for instance: ground/high level sources, passive and buoyant releases, buildings, complex terrain, chemistry, deposition and plume visibility. These studies are both short-term as well as annual, and involve tracer gases or specific pollutants of interest. The ADMS 5 validation documents, which describe comparisons with field campaigns and wind tunnel experiments, also validate many of the features of the urban air dispersion models ADMS-Urban, ADMS-Roads and ADMS-Airport, as the underlying ADMS scientific model code is shared. The urban air dispersion models are most commonly validated in real-world situations where there is significant uncertainty in the model inputs, although papers describing direct validation of dispersion from ‘road’ and ‘aircraft’ emission sources are also given below. 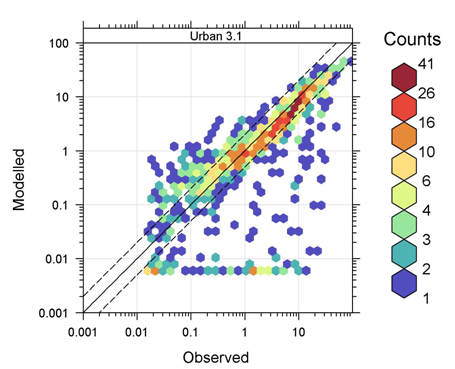 For an overview of validation of the urban models, see this summary (.pdf). Airports, which gives papers specifically related to the ADMS-Airport model. All the ADMS dispersion models and FLOWSTAR-Energy share the same underlying scientific model code for the calculation of flow and turbulence over complex terrain; this is validated in the documents listed below under ‘Flow field’. For full list of CERC publications go to www.cerc.co.uk/environmental-software/publications.html.